ESP Auto Inc., Services: Engine Diagnostics | ESP Auto Inc.
Modern cars are highly sophisticated and increasingly rely on computers to run efficiently, cut hazardous carbon emissions, and to increase the efficiency of their fuel. But just as the computers – with their network of sensors and controls – take care of your car’s components, we must also take care of the computer. When a problem is detected, a “check engine” light or other dashboard light may appear to notify you to bring your vehicle in to get it checked out. The symbols for all of the dashboard lights are described in your owner’s manual. For your own peace of mind, it’s a good idea to familiarize yourself with these symbols. 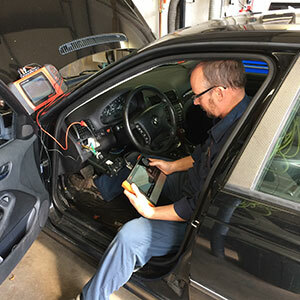 When you bring your car in, we can read the computer codes to determine whether you really have an issue or whether it is just a sensitive sensor. Contact us today if you would like to schedule an appointment for a diagnostics evaluation!